A long term goal of mine, has been to get “account requestors” to take ownership of their Service Accounts. Attempts have been made by my predecessors to record an owner of a service account, but it has simply been done as a string attribute of the AD object. Thus, when the person leaves and the account is deleted, the service account becomes orphaned, with an reference to a long forgotten ID. So thinking of a way to carry this out….. I am already using the email address of the owner of an administrative account to make decisions about whether the administrative account should be enabled or disabled – based on the end date of the owner – discovered by looking up the email address in the MV. When the account falls into scope, the managers email address is set into that new attribute – in the sync engine create a direct flow to put that into the MV (I’m using “serialNumber” – for one reason or another, that I wont go into :)). I have on the import from AD, some code to set an MV boolean flag – “functionalID” – if the DN of the person object contains the strings found in the Service Account OU’s, thenfunctionalID = True. This attribute is pushed into the portal and is used in set definitions. Of course after initial code definition, I found another of those inevitable exceptions, so added the generateArrayFromFile function, with a reference (in txt file) to the email address that should be ignored. Create a set: FunctionalID = True and FunctionalID-owner-expiring = True. 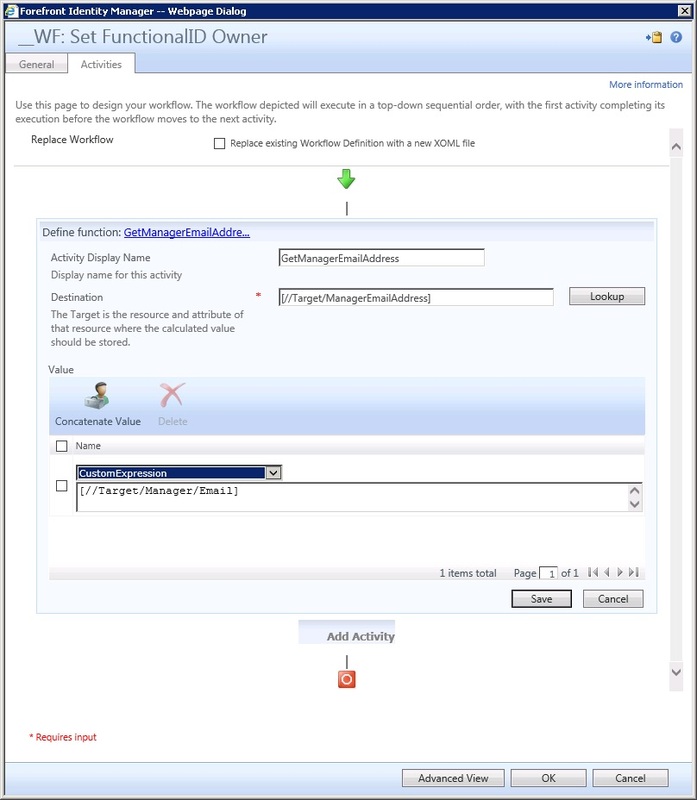 Create notification workflow and mail template: notification to [//Target/Manager], then the set transition MPR. I think I have it, just need to do a little testing to see that it works as expected. I’m still a long way from the stated goal, as I still need to find “owners” for all of those accounts that have been created in the past.